As we get ready to ring in the New Year, it’s a good time to take a moment and look back over the year that was. A lot happened in the world of poker, online and off, in 2013. So much poker news that it’s taking us three posts to review it all. Of course of greatest interest to the readers of this blog, no doubt, are the strides made this year in legal U.S. online poker. Three states – Nevada, Delaware, and New Jersey – launched their real money online poker games to their residents. Nevada was first to pass legal intrastate online poker, back in 2011, and the first to implement it, in April, when its first real money online poker site, Ultimate Poker, went live. Later in the year, in September, Caesar’s opened WSOP.com, a site branded after the World Series of Poker. This was followed by Delaware’s launch of its legal real money online poker offerings for residents of that state. And while its a much smaller market than either Nevada’s which preceded it or New Jersey’s which followed it, it’s one more state on board with online poker legalization, and that’s no small reward, especially to the players living in that state. After Nevada and Delaware came, in November of this year, New Jersey rolling out its legal online poker sites. Already, just one month after this launch, statistics show over 100,000 New Jersey residents have signed up for real money accounts with these new intrastate online poker sites. 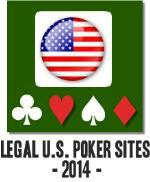 What states will we see pass legal intrastate online poker legislation in the coming year?